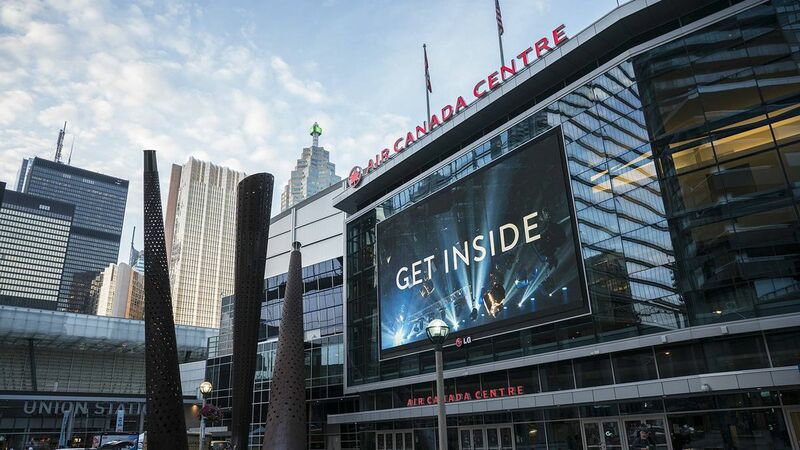 The Air Canada Centre as seen in Toronto, Ont. on Tuesday August 29, 2017. Toronto's Air Canada Centre (ACC) is being renamed Scotiabank Arena in an $800-million deal over 20 years that marks one of the biggest investments in naming rights in North America. The agreement announced on Tuesday by Bank of Nova Scotia and Maple Leaf Sports and Entertainment Ltd. (MLSE) is 10 times the annual $4-million Air Canada paid to attach its name to the home of the Toronto Maple Leafs, the Toronto Raptors and a number of A-list concerts and other events. Other recent naming deals for coveted sports venues in the United States have gone for significantly less. Last year, the NBA's Golden State Warriors agreed to name its new arena the Chase Centre, in a deal with JPMorgan Chase estimated at more than $300-million (U.S.) for 20 years. The play is Scotiabank's latest move to market itself as "Canada's hockey bank." Scotiabank sponsors community hockey clubs across the country, all seven Canadian NHL teams, and is the official bank of the NHL. To allow another company or even another bank to take top billing at one of Canada's premier venues would be to risk giving up Scotiabank's dominant position as a sponsor of hockey in Canada. "This is good value at this point in time, and I anticipate it to increase in value like a good property should," said the bank's chief marketing officer, John Doig. Over the past decade of sponsorship endeavours, the bank has found that nothing raises its brand equity more noticeably than hockey. And the second-biggest lift comes from its Scene loyalty program, which has more than eight million members. "If we can figure out how to bring the best of both of those worlds together, it affords us a very unique opportunity," Mr. Doig said. As deals become more expensive, they also become more competitive: One source inside MLSE confirmed there were at least eight serious interested potential sponsors initially, but that this group was soon winnowed down to a "handful" of parties with whom talks took place. "I think all things being equal, we would have remained Air Canada Centre," said MLSE's chief commercial officer, David Hopkinson. "But this is a hungry business. … We were looking for a much bigger number." There are only so many venues that are built or come up for rights deals each year and that scarcity pushes up the price as well. Last year, the NBA's Golden State Warriors agreed to name its new arena the Chase Centre, in a deal with JPMorgan Chase estimated at more than $300-million (U.S.) for 20 years. And the financial services giant spent an estimated $300-million for 10 years to own most of the space inside Madison Square Garden in New York – though the building's name remains unchanged. Insurer MetLife nabbed the naming rights to the home of the New York Jets and Giants in 2011 for reportedly more than $400-million for 25 years. "The fact that the team seems to be steered by stellar leadership right now … [with] a coming crop of stars like Auston Matthews, Mitch Marner and William Nylander, that helps," Mr. Hopkinson said. "I think that if we'd been out in the marketplace with this naming rights opportunity as recently as two years ago, I don't think we'd be seeing the same outcome we're seeing today." The deal is also a representation of a boom in sponsorship spending in general, as marketers struggle to find new ways to reach consumers in an increasingly cluttered media environment. Companies spent $1.98-billion on sponsorship fees in Canada last year, according to the most recent Canadian Sponsorship Landscape Study, conducted by Ohio University professor Norm O'Reilly in association with sports marketing firm T1. And "activations" that make people aware of those sponsorships, such as advertising, promotions and events, accounted for roughly another $1-billion. Those numbers have doubled in the past 10 years, according to the research. Such deals are particularly important for what's known as "earned media" exposure – as opposed to "paid media" such as ads – because they mean that the sponsor's brand is baked in to coverage of everything happening at the venue. Media include the name in their coverage of teams and big-ticket matches; the brand appears in TV images of major events through permanent ads in and around the venues; on digital properties associated with bookings there; and the buildings themselves act as giant billboards. Contrast that with a media environment in which consumers are bombarded with digital, outdoor, print and broadcast ads, seemingly at every turn. "This is a bit of an eye-opening price tag compared to the types of deals we've seen recently in the U.S. No question," said Dan Parise, New York-based vice-president and managing director at Scout Sports and Entertainment, which has negotiated such deals. "But if you think about the increase in media and distribution rights in sports and entertainment over the last decade plus, the increase in naming rights is not out of the realm of belief." "TV is completely cluttered," said Brian Cooper, CEO of marketing agency MKTG Canada who counsels brands on sports sponsorship deals, and was part of Scotiabank's team negotiating this deal. "There are hundreds of channels and you can zap every commercial. … Live sports, it's the only thing people are not zapping through. Venues are becoming more important, and more expensive." Social media conversations are another area of value that were not even considered as part of naming deals just 10 or 15 years ago, Mr. Parise said. "Hundreds of thousands of consumers go through a stadium, and everyone is there because they're passionate about what they've come to see," whether sports, concerts or other events, Mr. Parise said. "It's an environment that's ripe for social [media] sharing. The naming partner really benefits from that." "As the Leafs rise, which we believe they will, the branding opportunities are there. … It was a no-brainer," Mr. Cooper said. As a former MLSE executive, he was also at the table when the original deal with Air Canada was negotiated and was a former president of the Toronto Argonauts. "It's an iconic team and property, situated on Bay Street in the heart of the financial district, which is the heart of Canada's business community." The ACC is not just the home of the Toronto Maple Leafs and the Toronto Raptors; it is also home to a number of A-list concerts and other events. In terms of attendance and the number of nights each year the venue is booked, it is "the busiest facility in Canada and it ranks, depending on the year, [among] the top 5 in the world," Mr. Doig said. "Experiences are important, particularly for younger consumers," said Gord Hendren, president of Toronto-based research firm Charlton Insights. "Having your brand associated with a facility that provides an experience, creates another opportunity for Scotiabank to connect." In addition to brand exposure, naming sponsorships allow a marketer to conduct additional promotions and events on-site, as well as to host current and prospective clients. And MLSE has been a "tremendous partner" when it comes to introducing Scotiabank to other corporate partners, Mr. Doig said, "so that there's opportunity to be the banker of other people." More initiatives that are part of the deal have yet to be announced, he added. MLSE will also benefit from Scotiabank's efforts to use digital and mobile technologies to communicate with the bank's customers – using its insights to connect to fans both at the rink and watching at home, Mr. Hopkinson said. The bank can also give MLSE access to its analytics team to assist in crunching large sets of data to better understand hockey fans, Mr. Doig said, and the deal will give MLSE a window into Scotiabank's Scene loyalty program. Many of those are young people who the NHL has an interest in courting as future fans. The deal ends Air Canada's naming rights, but the airline said on Tuesday that it will continue its sponsorship as the official airline of both the Leafs and Raptors.